Marketing sure isn't an environment for the faint hearted, but if you love being a busy bee, creative and an integral part of a company then it might just be the route for you. 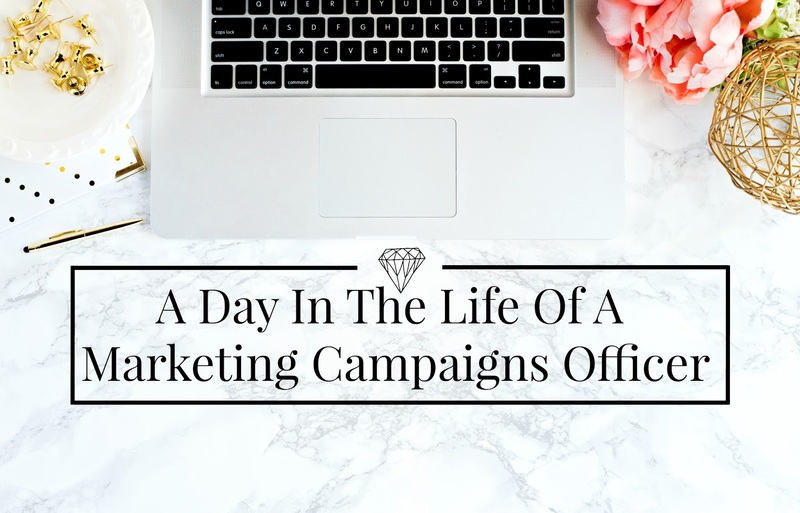 As a Marketing Campaigns Officer, my main responsibility is to oversee the company's marketing campaigns and to play a key part in communicating our message. The job is extremely varied and involves planning and executing campaigns, project management, analytics, digital, PR, Events and much more all at a very fast pace! So here is a snippet of an average day as a Marketing Campaigns Officer. By 9am I am usually well stuck into my emails, as I work within a 24hour industry a lot of communication comes in overnight and early in the morning, so I really need to be on the ball and getting the information I need to set up the campaigns for that day and also for the rest of the week. My favourite time of the day! A board meeting with my Marketing team, which allows us to catch up on projects and feel with any urgent campaigns. It is often also the last chance I get in the morning to run any major campaign decisions past senior management and also our marketing director. It's also a great time to discuss trends, social media and also to get the low down on how the graphics team are getting along with their print and web deadlines too. This is a pretty stressful time of the day, as sign offs and approvals for the day and week ahead need to be coming through. If sign off goes much past 11.30 it can make the day very challenging indeed! Not only am I working on sign off for about 6 future campaigns, but at this time I will also be working on sending a major campaign for that day. If there is a particularly hard sign off then it can go anywhere between 2-3pm, which is usually cut off for a campaign that would then be moved to the following day. We usually have another quick team catch-up at this point, as well as heading over to our office snack box for some mid afternoon treats. With anywhere between 2-10 campaigns on the go or in very close proximity 3.00pm is a good time to consult the to do list and also discuss with the designers to see how the campaigns are looking. I also consult our job bag system to see whether any new job bags need to be written for campaigns, or if any have been completed and can be filed. Fingers crossed by 5pm most things have been wrapped up, or at least have an action plan. So, I use this time to either create web support for my e-mail campaigns due to go the following day, or sometimes I will use this time to give myself a little creative break and research competitors and new ideas, which I can bring to the board meeting the following morning. Prior to my role as a Campaigns Officer I used to work as a Digital Marketing Assistant, so I like to still utilise my experience and passion for Social Media to help my campaigns. Emails never ever stop coming in and usually by the time I've finished one I have at least another five in my inbox. I like to check my emails before I leave between 6.00pm - 6.30pm and usually I will update my to do list, so that when I come in first thing my list is organised and de-cluttered. What does it take to be a Marketing Campaigns Officer? I always worry that quieter characters might think Marketing isn't for them, but honestly you don't have to be the loudest person in the room to succeed in marketing. As long as you have good determination and have an eye for detail and creativity, you will go far! It's definitely a challenging environment, which comes with extreme highs and lows, but with a positive "can do" mentality any hurdle can be overcome and seeing your work do well is truly rewarding. I hope you enjoyed this post! Do you work in Marketing, or see yourself moving towards Marketing in the future? This was such an interesting read! It sure sounds like you have a busy day!